It’s Monday (don’t they come fast) and our 39th theme for #FoodieMonday#Bloghop is #MothersDaySpecial. For this theme we were allowed to make something special for our mums or prepare one of their recipes. I chose to prepare one of my mum’s all time famous and popular dish, her maida parothas. She would make these simple and yet so so so delicious parothas for breakfast. She always prepared hot ones for all of us. It was an absolute treat to have these parothas with masala tea and pickle. 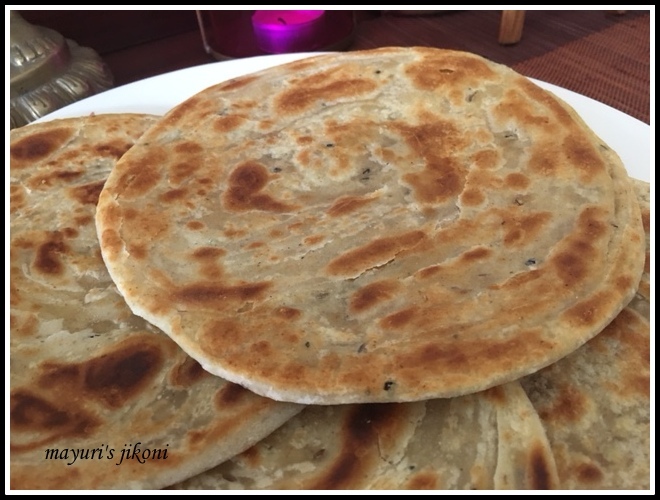 When she became too sick to cook, I had on occasions prepared these parothas for her and she enjoyed them.My mum mostly made Gujarati style food. Her secret was to keep it simple, using simple fresh ingredients. Part of the reason for starting my blog was to note down some of her famous recipes before they just got lost. Its a pity she never got to see how many of her recipes I have made. I’ve made her favourite dishes and her specialities. She loved idlis and khandvi. Only she could make mum’s soup, vaghareli rotli and Mum’s buitoni taste so special. No exotic spices or mixes. Mother’s Day since 2012 have been very emotional for me.I miss my mum even more when I see friends and family sending Happy Mother’s Day messages to their mums or posting pictures with their mums. My daughter always claims that she is there so I shouldn’t miss Ba too much as my kids called her. I remember when my mum passed on, a few of the women in our family said that they were there for us in place of my mum. Many have been there for us since but no one can replace your mum. I nearly didn’t want to do this post when my fellow friends chose the theme. The whole week was quite emotional for me trying to remember things she loved and things that she prepared for us handvo, dhebra, kachoris, besides the above mentioned dishes. Its only when on Friday I made her famous maida parothas that I felt good instead of feeling sad. She always called them Maida na parotha… not even parathas. Parotha is a Gujarati word. Happy occasions, sad moments, when something needs to be shared, when I need advise, is when I miss her the most. I miss her on my birthdays, its begins with a good cry as without her I would not be in this world. Missed her terribly when my son got married. When she saw a photo of my daughter and her fiance a few years ago, she told me that, that is Nami’s boyfriend. I told her no, they are just friends but she knew way back then what the future is going to be. So I guess when my daughter told us about her boyfriend my mum must be have been smiling and thinking “I told you so”. Well before I end up writing a whole book about her, here’s her famous Maida Parotha recipe. Simple but satisfying. I must also mention that the crockery I have used was given to me by my mum. Years ago when she came to visit me, she saw that I had all different coloured and types of plates. Nothing really matched. I had other priorities then, as I had 3 school going kids. She bought me the whole set plates, sides plates, cups, saucers, bowls, soup bowls, serving bowls, platter, glass. I’ve had it with me for now over 20 years. Add flour, salt, hing, pepper powder, cumin seeds into a big bowl. Using warm water, form the dough. Just mix till the dough is formed. Do not knead it too much. Cover the dough and let it rest for at least 15-30 minutes. Heat a frying pan or tawa over medium low heat. Divide the dough into 8 parts. Roll each part into a ball. Take one ball and using flour, roll it out into a 7-8″ diameter circle. Smear the rolled circle with about 1-2 tsp oil. Sprinkle little flour over it. Cut the circle into strips. Starting from one end, roll up the first strip. Place the rolled dough on to the next strip and roll. Continue till all the strips are rolled. Place the dough on the rolling board with the spirals visible on top. Sprinkle little flour and roll this into a 7-8″ circle again. Put the parotha on the hot tawa. Roast one side and flip it over. Roast the other side. Drizzle oil around the edges and cook both sides till the parothas are light golden in colour. Repeat steps 8-17 with the remaining dough. Serve hot parothas with masala tea, pickle or even a curry. Perfect paratha!!!! Love this pepper and jeera combo!!! Perfect Maida Na Parotha recipe Mayuri! Love and hugs to you. Mom's Receipe is always a keeper. I just love this Parotha.Glad you have put forth your emotions for your MUM and shared these wonderful memories with us. Waagmi I too love the jeera and pepper combo in my parathas. Thank you Alka for the kind and comforting words. Thanks Moumita. We make all our parathas with atta but my mum made these ones with maida. Thanks Preethi. I do chersih all my mum's recipes.